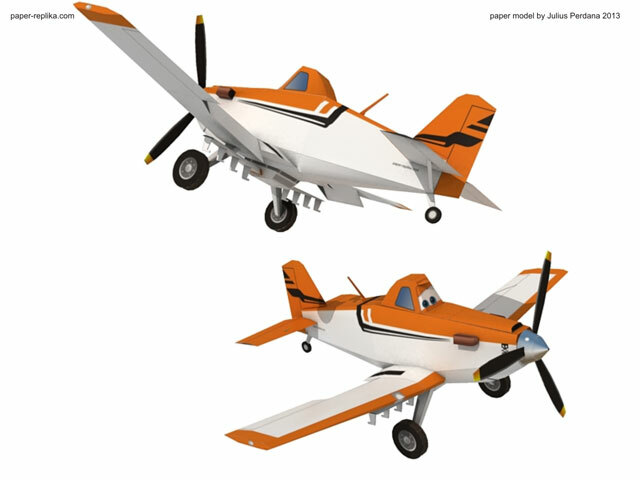 Dusty - Disney Planes Paper Model	. Just like Disney Cars movie I love the Planes 3d animation. 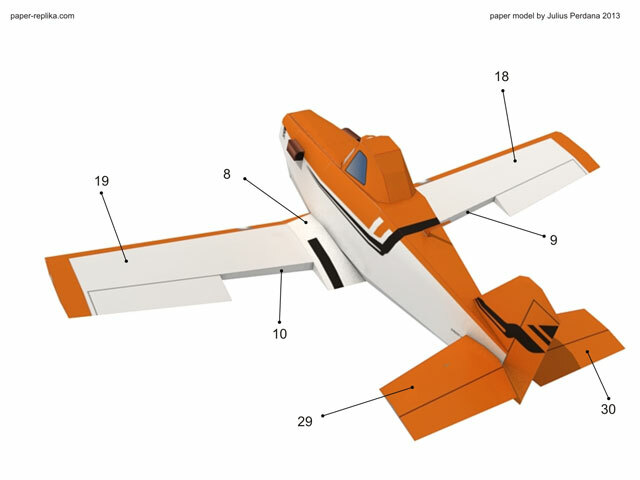 Last month I saw this Dusty airplane toy in toy store in a mall and I thought I have to made this into paper craft template, so here it is. The template consist of 4 pages of patterns. 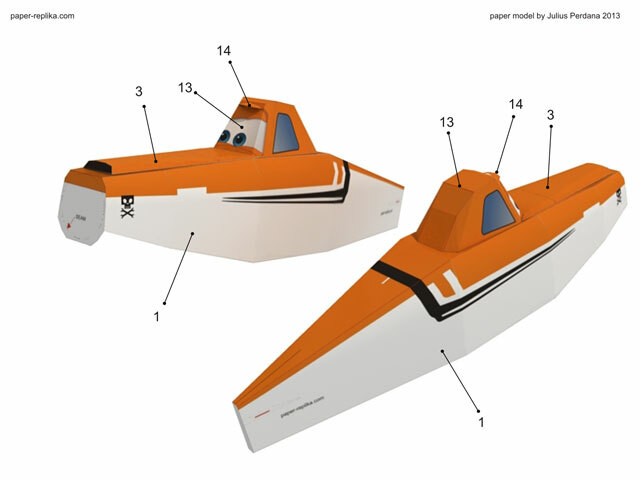 Just like the Lightning McQueen paper model, the part should be shaped as smooth curve to get the best result. 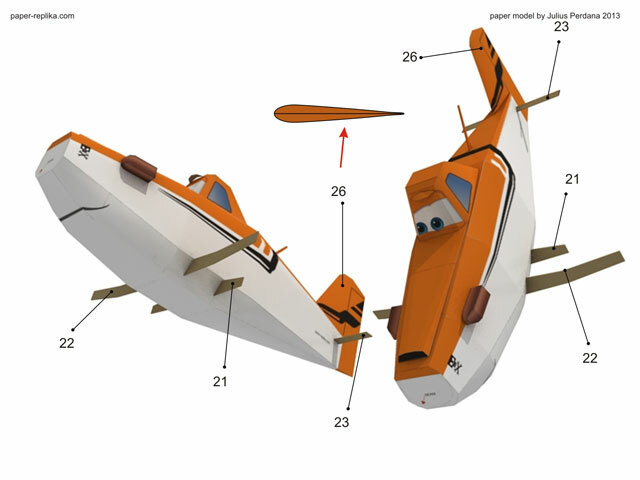 I made Dusty's livery template before he involved in air race, so it will open a new template to be made, which is Dusty's race livery. 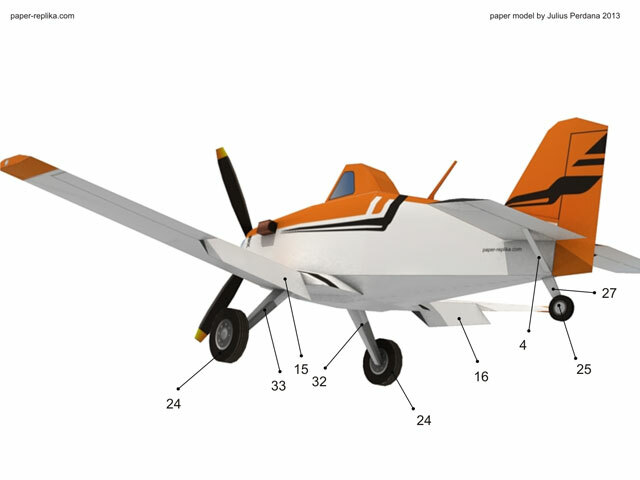 The complete paper model will have about 30 cm wingspan. Shape the edges of the fuselage (part 1) into smoothly curved before applying the glue. Add engine hood with air intake (part 3) on top the nose. Attach the cockpit / Dusty head (part 13) in place. Add small cap on Dusty's forehead (part 14), curved the cap first before adding it. Add both engine exhaust pipes (part 20) on the side Dusty's nose. Shape the fuselage bottom curved (part 6) before attaching to the main fuselage. Add antenna (part 2) in place. 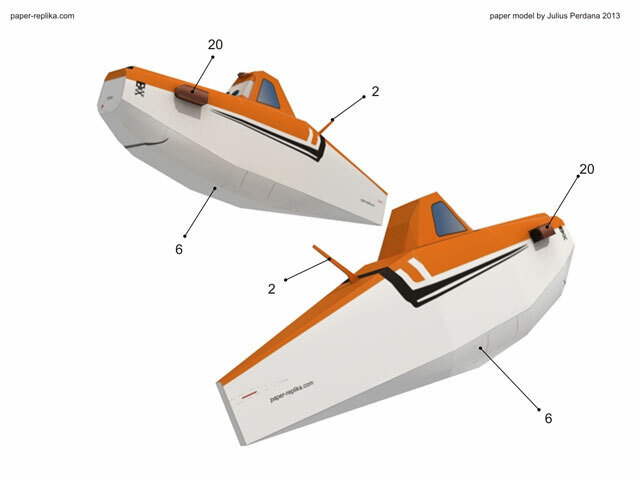 On page 4 in the template there are 3 parts on the bottom of that page, they are wing's spars, layer them with cardboard. Place them in place like the picture above, make sure they are centered. Place the vertical stabilizer in place. When fold the vertical stabilizer make sure you shape the part so there is a pocket of air, just don't fold it flat, but make it hollow like airfoil shape. Assembly both wing parts set, part 19,8,10 = left wing and part 18, 9, 7 = right wing. 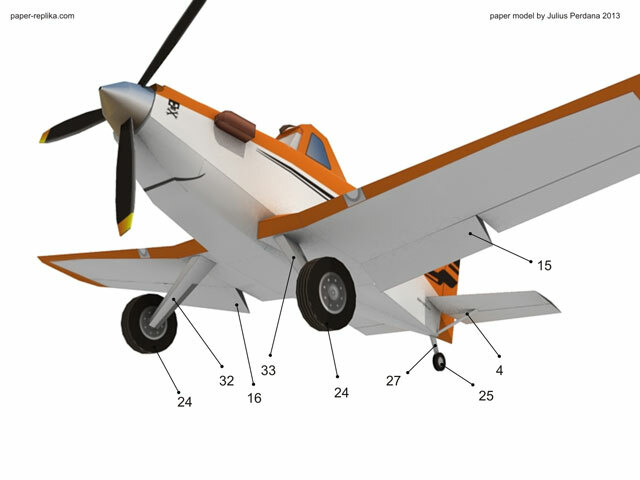 Attach wings in place. 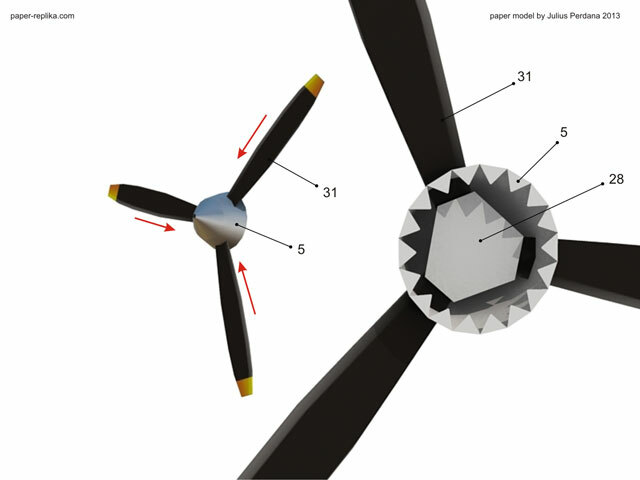 Insert 3 blades (part 31) into 3 holes on the spinner (part 5) and then fuse them together with part 28. 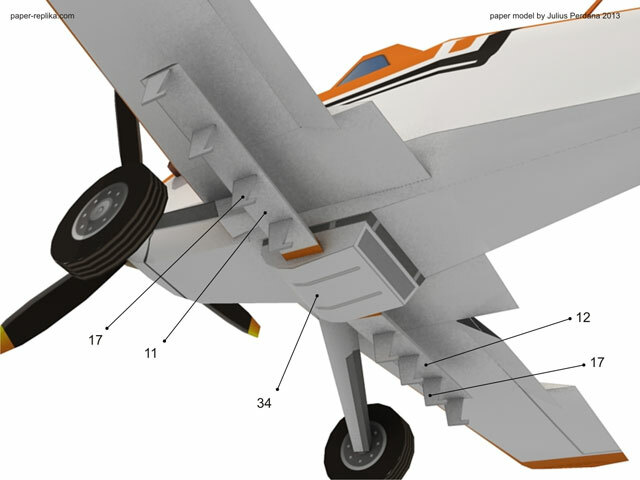 Add front landing gears (part 32,33 and 24). Rear landing gear (part 25, and 27). Flaps (part 15 and 16). Tail wing suspender (part 4). 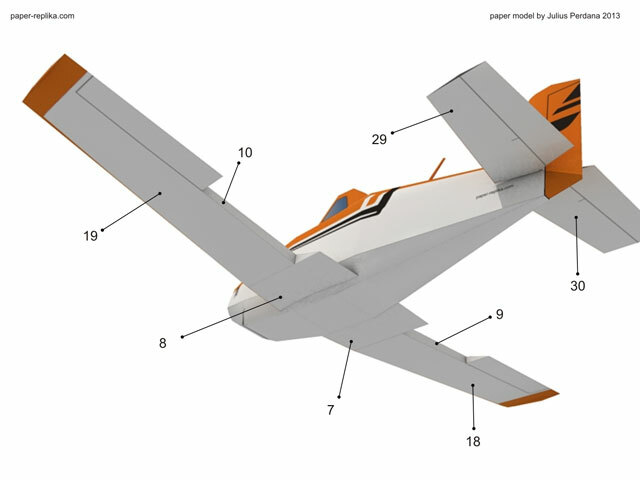 Finally, complete the model with attaching spraying system (part 11,12,17 and 34).